When you think of whales, do you think of Shamu, the black and white orca whale at Sea World? Or, perhaps you think of the huge whale that swallowed Pinocchio in the Disney movie. Both images are correct. There are two types of whales: toothed whales and baleen whales. Whales are thought to be one of the smartest animals on Earth and that’s not all about whales! Most whales have teeth. Toothed whales are smaller than baleen whales and they only have one blowhole. Baleen whales don’t have teeth. Instead, they have baleen, which is sort of like a sieve or coffee filter in their mouths. Most whales have teeth. Toothed whales are smaller than baleen whales and they only have one blowhole. There are over 80 species of whale. Whales are thought to be one of the smartest animals on Earth. Whales can talk to each other through chirps, squeaks or whale songs. Dolphins are a type of whale. Whales are expert divers and swimmers. The sperm whale can dive to a depth of two miles deep and hold its breath for more than two hours! Whales migrate from cold arctic or Antarctic waters to warmer waters to have babies. The largest of the whale species is the blue whale and its heart can weigh as much as 1300 pounds. Now that’s the size of an average family car. Its tongue can weigh as much as our largest land mammal, the elephant. The largest whale ever recorded to this day (data July 2018) was a blue whale measuring an astonishing 111 ft. The dwarf sperm whale is the smallest of all the whale species. They grow up to 8.9 ft (2.7 m). 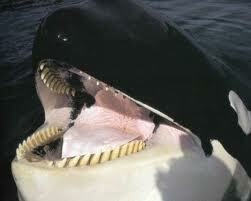 Orca whales have been known to attack and eat great white sharks. 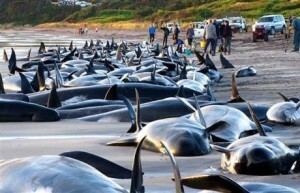 A whales age can be determined by counting the rings in its earwax. Whales have to surface for air or they will drown. Whales do not drink the salty sea water, instead they get the water they need from their food source. A baby blue whale when born weighs over 3 tonne, in fact they can weigh as much as 7 tonnes. A Narwhals tooth can grow up to 10 ft.
Whales are fast swimmers and reach speeds up to 30 mph. A sperm whales brain can weigh as much as 9 kg. Whales have super duper hearing. Whales give birth to only one baby at a time (calf). Polluted water can make them sick. A BBC excerpt documentary about humpback whales. Question 1: What do whales eat? Answer 1: Toothed whales use their teeth to tear herring and other fish. Baleen whales eat krill, which are tiny shellfish. Question 2: Are whales endangered? Answer 2: Whales were hunted for many years for their oil and meat and some species are extinct. Today, whales are protected, although they are still hunted in some countries. Polluted water can make them sick. Question 3: What is a group of whales called? Answer 3: A group of whales is called a pod. Although you may also hear a group called a herd, gam or school. Question 4: What is a baby whale called? Answer 4: A baby whale is called a calf. A Mommy whale is called a cow and the Daddy whale is known as the bull. Question 5: How long can a whale live? Answer 5: Depending on the type of whale. 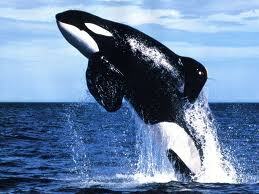 For example the Killer whale lives on average 29 years while the Blue whale can live up to 90 years. A Sperm whale up to 70 years, Beluga Whale up to 50 years. Humpback whales can live up to 50 years also. Now wait for this one, the Bowhead whale can live up to 200 years of age according to scientists. While a 200 year old Bowhead is rare a small percentage of Bowhead whales live between 160 and 180 years. Question 6: What is the largest whale species? Answer 6: The Blue whale is the largest of the whale species. At a whopping 98 ft or 30 meters. True giants of the ocean. Apart from the whales massive length its a heavyweight coming in at 173 tonnes. That was the maximum weight recorded so far for the blue whale. Enjoyed the Easy Science for Kids Website all about Whales info? Take the FREE & fun Whales quiz and download FREE Whales worksheet for kids. For lengthy info click here.